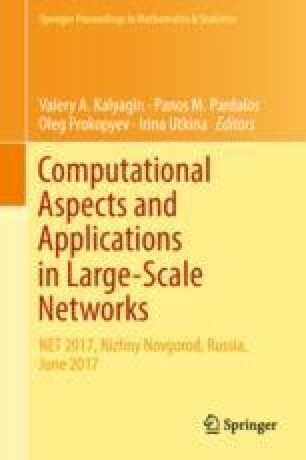 In network analysis, the importance of an object can be found by using different centrality metrics such that degree, closeness, betweenness, and so on. In our research we form a network, which we called company co-mention network. The network is constructed quite similar to social networks or co-citation networks. Each company is a node and news mentioning two companies establishes a link between them. Each company acquires a certain value based on the amount of news which is mentioned in the company. This research examines the network of companies by using companies’ co-mention news data. A matrix containing the number of co-mentioning news between pairs of companies is created for network analysis of companies, whose shares are traded on major financial markets. We used different types of SNA metrics (degree centrality, closeness centrality, betweenness centrality, eigenvector centrality, frequency) to find a key company in the network. Moreover, it was shown that distribution of degrees and clustering-degree relations for our network follows the power law, although with nontypical indicators of degree exponent. News analytics data have been employed to collect the companies co-mentioning news data, and R packages have been used for network analysis as well as network visualization. This work was supported by the Russian Fund for Basic Research, project 18-37-00060.